Clear Lake in Wasagaming in Riding Mountain National Park in Manitoba, Canada remains calm as a charter boat waits at the marina for its next load of passengers. A large charter boat remains idle at the dock at the marina along the shores of Clear Lake in the town of Wasagaming in Riding Mountain National Park in Manitoba, Canada. This large vessel is named the Martese and is the newest boat added to the fleet of charters weighing 78,000 pounds and offers passengers different cruises on the lake. There is a lunch cruise, mid-day cruise, dinner cruise and an evening cruise available with the three early ones offering an interpretative lake tour while aboard this charter boat. Various types of other water vessels can be chartered by visitors to Wasagaming, Manitoba such as canoes, kayaks, paddle boats, fishing boats, sailing boats, pontoons and ski boats. Charter boat at the Marina on the shores of Clear Lake in the town of Wasagaming, Riding Mountain National Park, Manitoba, Canada. 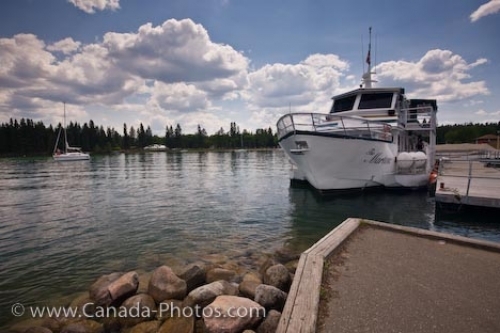 Picture of a charter boat at the marina at Clear Lake in the town of Wasagaming in Manitoba, Canada.